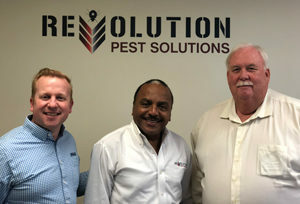 Tacoma, Wash.-based Sprague Pest Solutions has acquired Revolution Pest Solutions of Carson, Calif., expanding the company’s footprint in California. Terms were not disclosed, but four-year-old Revolution will operate under the Sprague Pest Solutions brand immediately and become part of Sprague’s Los Angeles service area. Revolution is a company that focuses on hiring veterans, as profiled in PMP’s July issue cover story. The acquisition is the second in California for Sprague. In 2016, the company acquired TMC Pest Management of Bakersfield, Calif., to protect food processing, distribution and transportation outlets in California’s agriculture-rich San Juaquin Valley from the threats posed by disease-transmitting pests. Sprague Pest Solutions provides preventive and remedial pest management and food safety consulting services to leading food processing, agriculture, healthcare, and hospitality and distribution facilities across the Western U.S. The company operates service centers in six states including Washington, Oregon, Idaho, Utah, Colorado and California.